Last night’s classes were all great fun, and the last one was a bit different. First, in the kids class, we reviewed a very direct kind of kokyu-ho from gyakute-dori, focusing on extending energy out beyond Uke. It’s interesting to watch the kids working on that. At first Sensei had them work by themselves, just standing in hanmi and extending energy through their outstretched, relaxed arms and fingers While they seem to get that idea of extension, when they went to working in pairs they seemed unable to trust that it alone was sufficient. Instead of simply extending their arm out past uke’s center, most of them resorted almost immediately to trying to push Uke over by shoving into Uke’s neck or face with their upper arm, and rotating across Uke’s center, clotheslining them. We probably all do this, especially as beginners in this particular technique, but in everything really. It’s hard to trust the correct energy and form will ultimately produce the best outcome, so we fall back on trying to force things to happen the way we think they should. Next, in the all levels adult class,We worked on a few techniques from ryote-dori (grabbing both wrists from the front), including tenshi-nage, kokyu-ho, and an interesting combination of the two, where the near hand does kokyu-ho while the far hand essentially executes the top half of tenshi-nage. The class was very technical, in a kind of centering and meditative way, really focusing on the minutia of our movements. A few good “aha” moments there, and I got some very helpful feedback from a couple of my ukes. As I’m training with my upcoming first kyu exam in mind, I’m noticing the sense of completing a 5,000-piece jigsaw puzzle. I have three of the corner pieces, most of the sides, and I can tell what most of the picture is going to be. Maybe I can see the whole barn, but a few key pieces are still out of place. And there are whole sections where I can’t tell how it’s going to turn out yet. In class it’s like I find pieces here and there. Sometimes I know just where they should fit, and other times I’m not sure, and just take note of them. In a lot of cases I can tell where pieces are missing, and I remember that I saw them, somewhere, a while ago… But now I have to go back and find them. It’s starting to come together, and I’m enjoying the process. Then there was the fourth-kyu-and-up class… It was different from any other class I’ve participated in. Usually, of course, Uke’s job is to provide a committed, clean, organized attack, appropriate to the technique being practiced. But this time, Uke was to be difficult, fighty, and explosive, complete with shouting, shoving, and hitting. Nage’s practice was to be compassionate and soft, calming the situation. It was really interesting seeing what each of us found easy and natural, and what made us feel awkward and uncomfortable. Some found that having compassion directed toward them felt intrusive, a violation of their boundaries. Others found it difficult to call forth compassion-for-no-reason, without the background of a situation that demanded it. I found it was challenging to continue exuding compassion in the first part of the exercise, when Uke was being bratty and dismissive (”Go away! Leave me alone!”). My natural inclination in that situation is to give up on them quickly (”Fine, whatever. Go be by yourself.”) But strangely it was less difficult later, when they were being aggressive and combative — that was easy to deal with. When it came to being Uke, being difficult, and explosively and continuously attacking Nage, everyone was able to access it, with varying degrees of sincerity and intensity. It’s hard to be either explosive or compassionate with no content to it, so some impromptu role-playing came up as a natural part of the exercise. Some pairs fell into the roles of friends, one trying to help the other. Others found that the roles of parent and child worked well. Imagine the kind of energy behind “I understand you don’t want to go to school, but you have to go,” and “I’m not going, and you can’t make me, and I hate you!! !” and you’ll have a good idea of the kind of energies we were playing with. The point of the exercise was to learn how to bring calm compassion to the situation, to quench Uke’s rage, and resolve things with no one getting hurt. And also to feel the effect of that kind of energy when it’s directed toward you. It was a very effective laboratory for seeing what works and what doesn’t. As Uke, the explosive, fighty one, when Nage was soft and accepting, absorbing the energy and slowing things down rather than being defensive and fighting back, the effect was to take all the hostility out of the attack. Sensei said we could be like 500 pounds of feathers, or 500 pounds of bricks. Either way, it’s still 500 pounds, still effective, but the feeling is very different. I noticed even when I had openings, I didn’t really feel like taking advantage of them. It felt like punching a pillow — nothing there to fight with — and I just ran out of intention. But if Nage felt sharp, quick, and reactive, it was easy to keep coming in, looking for any opportunity to gets the better of them and continue the attack. I think in any situation where we are in that frame of mind, upset and aggressive, we really want to find a quieter place. We don’t want to fight. If Nage can help us find that quieter place, we will willingly go there with them. All in all, a great, balanced day of training. Some good focus on technical precision, and a wider look at the big picture, a reminder of what Aikido is all about. Calm, raging, healing, still, swirling, enclosing, trickling, roaring, pooling, flowing, splashing, rising, infiltrating, overtaking, refreshing, silent, supporting, formless, cool, unstriving, unstoppable. One of the aspects of Aikido we are constantly exploring is that if an attacker or body does not perceive a threat (such as a strong grab or hard block) they will naturally not react defensively (or at all). Staying relaxed and soft can help the other person become relaxed and soft, too. There are many times when I am struck with gratitude for my teacher. Here is a man who has trained in Aikido for many years, who is a perceptual genius, and who has devoted himself to sharing the art with his students. The physical experience of training with him is that of being enveloped – utterly controlled, and completely safe. The emotional sense is one of total freedom to try, fail, and learn, again completely safe, trusting. But it’s probably true that more it stings, the more accurate it is, and the harder I’ve been trying to hide it. I’ve learned to allow for the possibility, even in my initial denial (which I now recognize as automatic, and meaninless), that there may be some truth there. “What did I do, or how was I being, that created that perception?" Of course, there is no differentiation between how I am perceived and who I am really. There is no "real us” that the world never sees. There is only how we come across to others. It’s a privilege to work with someone who sees so clearly. No one has ever had such faith in me to be open to straight, direct coaching, has been so unphased by honest communication, or so committed to helping me find my own way, with no expectations or obligations imposed. He helps me to see who I am. The same ocean breeze is here, warmed and softened as it made its way inland up nine miles of wide river valley, Still familiar, but stronger near these hills on the north side, it wanders in through the broad half-open door. 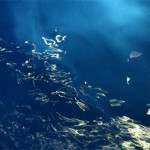 The bright high note of two small bells invites us to settle deeply into sitting, breathing. The river to our west flows in silence, but the distant freeway’s roar could be a river’s roar. Breathe. Spiraling fans above confuse and redirect the breeze. Inhale. The river-scented air expands our lungs and our awareness. We sit on what was fertile bottomland a hundred years ago. Exhale. Settle. The breeze touches our necks and lightly strokes our hair, like a lonely ghost glad to find company. An empty tanker truck rumbles and bounces down the road. Inhale. Inspire. Inspiration. Breathing. The soft mat and the hard floor and the fertile soil and the flowing river cradle us, sitting, eyes closed, in their open palms. The mission’s bell, still just a whisper here, sounds more urgent on this side of the valley. It calls the farmers in from their fields as it has for centuries, not knowing they are long gone, the farmers, and their fields too. Exhale, and let them go. We cultivate something else here now. Our work nourishes the spirit. The two small bells guide us back as the mission’s bell falls silent. The breeze remembers its direction and continues, through another door and up the valley. I am participating in a seminar this weekend with Robert Nadeau Shihan, at Aikido of San Diego. Friday evening was a question and answer session. Very interesting stuff. 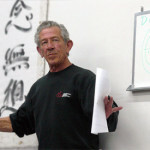 I feel very fortunate to have him here, and grateful for his time in sharing his realizations and experiences with us. 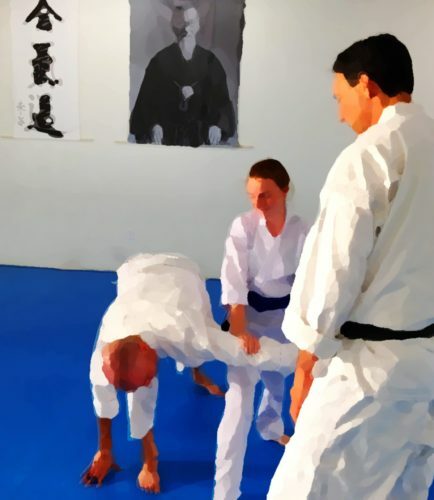 Every month or two Sensei offers an Aikido In Focus workshop at the dojo. This time the subject was jiyuwaza, or freestyle. One-on-one practice, using whatever techniques are appropriate to the circumstances. Jiyuwaza is great fun. It’s also a source of endless frustration because I get in my head and freeze up trying to think of what I should do next, instead of going with the energy given to me by my training partner. I go to these workshops regardless, because they are always a valuable experience. But an In Focus workshop on the “free” in freestyle? Heck yes, sign me up. Aside from being familiar with the format and the topic of the workshop, I had no preconceptions or expectations. Honestly, I hadn’t even had time to think about it. Every time I go to the dojo I take a few minutes on the way there to consider what I would like to get out of the experience. My hope for today was that I could let myself be open enough to get it. I got to the dojo, warmed up, and bowed in. These workshops are really experiential. You feel them. They get into your muscle memory and emotions. It would be very hard to write up any kind of synopsis. What it looked like was about a dozen people on the mat, talking briefly at first, moving into a standing body-awareness exercise, and then on to slow and simple, then progressively faster and more complex, partner practices that ended with people doing some really nice, flowing, centered freestyle. At the end we sat on the mat around a television, and watched video of our practice, critiqued ourselves, and got feedback from Sensei and the other participants. That’s not telling you much, but that’s what it looked like. The first of several “Aha!” moments for me came during an exercise we’ve done quite a lot. We walk around the mat at random, and randomly settle into a grounded, centered, aligned stance for a few moments. Then back to walking, and settle again. And then continuing with circling and settling. I had not realized it, but I’d been patterning. I had been alternating right/left foot forward in the stance I settled into. No big deal. Wendy Palmer Sensei, in her book The Intuitive Body – Discovering the Wisdom of Conscious Embodiment and Aikido speaks of the mind being like a puppy, running off, investigating everything, sniffing around… Through the practice of body awareness she describes in the book, we learn to lovingly call our puppy-mind back to sit quietly at our side for longer and longer periods. If the mind is a puppy, mine was a Border Collie this morning. Border Collies are herding dogs. They have a clear idea of How Things Should Be, and they actively work to make them be that way. If the cows get out, into Some Place Cows Should Not Be, a Border Collie will get upset, and will go herd them back into their pasture. This morning, in that first simple walking-circling-settling exercise, a space that opened up on the mat in front of me called for circling to the right. So I did. My Border Collie puppy-mind was instantly beside itself! “Woof, woof, woof!” We had just circled to the right the previous time, so we were (according to the pattern I did not know I had adopted) supposed to circle the left this time! Thanks to the work we had just done on getting into our bodies I had done what there was to do. I was able to notice, from a somewhat detached perspective, that my mind was going off about it. I had not thought about it first, and then rejected the option of circling to the right. I just circled. It was a little thing, tiny, but significant. I felt the space. I moved without checking in with my mind. I noticed my thoughts, but they carried no weight. I was thrilled. One point Sensei brought up that stuck with me is that we can’t “stop thinking so much.” The mind just goes on thinking. Thinking about trying to think less doesn’t make for less thinking. Instead, Sensei suggested that we focus on being present in the body. The exercises at the start of the class were to help us get into our bodies. I should make a habit of doing them every morning. We’ve done them before, in other workshops, and they have a profound effect on me. I find I’m more open and aware, quieter, more balanced… It’s a state that’s incompatible with frantic rushing about. Time moves more slowly. I’m able to more fully experience whatever it is I’m doing at the moment. Peripheral vision expands. It’s the calm that comes from being in nature. It’s a state I usually only get to after a week-long vacation. I’d like to get there more. Near the end of the workshop, when my partner and I were waiting our turn on the mat in front of the rest of the group, there was a minor injury. Everything stopped, people went to help, and ice packs were brought out. The person was made comfortable on the mat where they could continue watching, and the next pair was called up. I noticed an interesting thing: Whatever that state was that I’d been in for the past hour and a half was shattered. I had been feeling relaxed, confident, and looking forward to our turn to “play” just moments before. But now suddenly found I was right back into thinking about what techniques I’d do, and worrying that I’d freeze up. And there was something physical, too. Some new awareness, or something missing… I’m not sure. It was like snapping out of hypnosis and wondering why you’re standing on a stage in front of all these people, holding a microphone. The good news is that, having just been in a better place, I recognized that I was not there now. Sitting there, I went back to the exercises from the start of class, feeling the mat supporting me, doing an inventory of tensions and sensations throughout my body. I was mostly able to get back to that place. You know how it is when you crack open a beer after a long day? The “pssst” when the cap lets go? The cold condensation and wet glass and label against your palm? You lift the bottle, and immediately relax a little. “Ahhhh… Life is good…” Your problems seem a little less troubling, and your friends seem a little more dear. The beer has done nothing at this point. It’s all you. A conditioned response. You can jump into that zone on just a few cues. I have the same kind of experience when I step onto the mat before classes in the evening. Everything else from the day drifts off on the breeze, and there is only the present reality of the dojo. This is something I’d like to explore with getting to the state of being that was evoked in the workshop. With practice, it should be available more quickly, naturally. We have the skill to make that shift. We do it automatically and unintentionally all the time. I’m going to play with doing it intentionally. I spent the rest of the day quietly doing errands and chores, reflecting, feeling what there was to feel, and wondering in gratitude at the privilege of working with such a gifted teacher and guide. I am always amazed at what can be experienced in only a short two hours. Often these workshops take days to sink in. I can still feel the energy resonating. There’s more there.